Metal Gear Survive and Trails of Cold Steel III playable. Konami has opened its official Tokyo Game Show 2017 website, announcing the lineup of games it is bringing to the expo in September. The demo available at Tokyo Game Show 2017 will include a four-player co-op mode with two stages, and with varying levels of difficulty to choose from. Those who play the demo will get a Metal Gear Survive sticker. The new three-versus-three co-op mode will also be available to play at the booth. Konami booth visitors can pick up an original sticker. Enjoy a special moment with the Tokyo Game Show 2017 limited demo of Love Plus Every, which will be playable in virtual reality (mobile). Those who play the demo will get an acyrlic key chain, and Konami booth visitors can pick up an issue of Falcom Magazine. Those who play the demo will get a coaster. 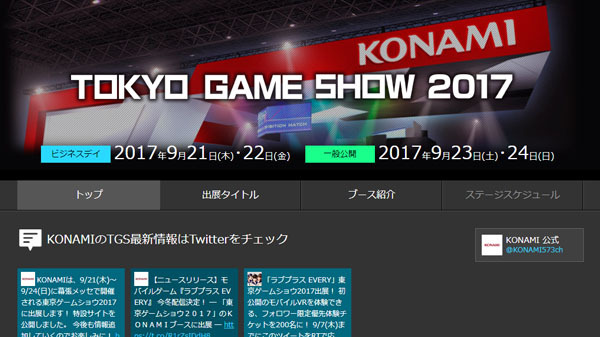 Konami has yet to announce its schedule of stage events. Tokyo Game Show 2017 runs from September 21 to 24.